Filing IT returns makes you a responsible citizen of your nation. This can boost chances of getting a suitable home loan if you apply for one in the future. Some credit card companies demand proof of tax returns before issuing a card. In cases when you want to claim adjustment against past losses, a return is compulsory. Filing returns may prove useful when someone needs to file a revised return. A person cannot file a revised return unless he/she has filed the original return. 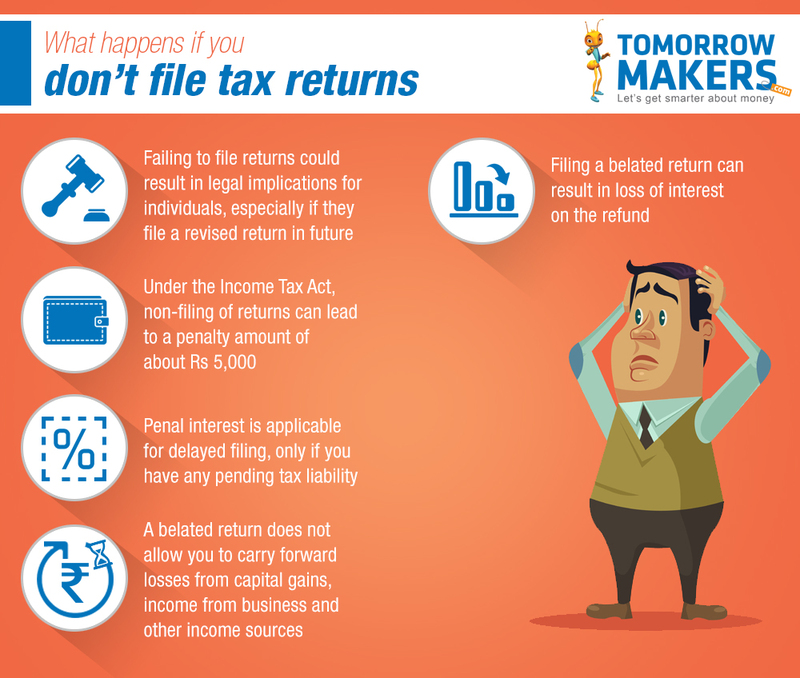 Why should I file income tax return? Even if your income level does not qualify for mandatory filing of returns, it may still be a wise choice to voluntarily do so. Why? For instance, the returns can serve as proof of your income if you apply for a loan as a co-borrower. If international travel is on your list, IT returns can be useful when applying for a visa. Additionally, in most states, registration of immovable properties requires advancing as proof of tax returns for the last three years. Who is responsible for filling a tax return? For the current year (FY 2016-2017/ AY 2017-2018), tax returns must be filed before 31 July 2017 for individuals, and by 30 September 2017 for businesses. Following is the list of people for whom filing returns is mandatory. Assesses whose gross total income is over the exemption limit for the year. The limit is 2.5 lakhs for those below 60 years, 3 lakhs for those between 60 and 80 years, and 5 lakhs for those over 80 years. Filing income tax returns can now be done online, making the process easier and less time consuming than it was before. There are different forms available for filing returns, based on different criteria. So, ensure you understand these and follow them correctly to avoid any trouble later. When it comes to filing income tax, the most essential document for both, individuals and businesses that pay tax is the PAN card. To simplify the entire process and make it more transparent, linking the PAN and Aadhaar card has become necessary. The Income Tax Department has now enabled a new and easy way of linking both documents on its e-filing website. This will help the government keep tabs on all taxable transactions. Ensuring individuals and businesses have only one Aadhar and PAN card will limit the possibility to apply for multiple PAN cards, thus reducing tax evasion. Another major advantage of the PAN-Aadhaar Card link is that people will be able to file their e-returns, or online Income Tax returns seamlessly and quickly. By linking the two, it will no longer be necessary to submit Income Tax acknowledgement to the IT department, thus saving tax payers a lot of hassle. Filing IT returns is a social duty of every responsible Indian. Additionally, filing returns before the end of every financial year will help avoid any other penalties. Related: How tax-savvy are you? Find out with this quiz!